The Associated Press reports that Harvey Milk was inducted on Tuesday into the California Hall of Fame, along with 12 other notables from the Golden State. Thirty-one years after Milk and Mayor George Moscone were assassinated by former San Francisco City Supervisor Dan White, Milk will be featured for the next year in the California Hall of Fame section of the California Museum in Sacramento. Milk, who had served as a San Franciso City Supervisor for 11 months, was 48 at the time of his murder. According to the Bay Area Reporter, Milk’s nephew, Stuart Milk, received the commendatory Spirit of California medal marking his uncle’s induction from Governor Arnold Schwarzenegger and First Lady Maria Shriver. Andy Grove, the former CEO of Intel, read the citation. Interviewed at the induction event, former campaign manager for Milk’s historic 1977 election campaign, Ann Kronenburg, called the honor, “definitely long past due.” Smiling, she told reporters, “Harvey’s up there right now dancing.” When asked about the importance of Harvey Milk to the LGBT community of California, Kronenburg quickly corrected the reporter, “To the world’s. Since the movie [Milk] came out I have continually received letters from around the world about what Harvey’s story means,” she explained. “And what it means is there’s hope. There’s so much hope.” Milk’s Hall of Fame exhibit features a recently-opened urn containing a lock of his hair, a letter in his handwriting, a campaign button, and a rainbow flag. The memorabilia were held by the Congressional Cemetery in Washington, D.C. until transported back to California for the exhibit. Some 50,000 school children are expected to visit the exhibition during the coming year. Though there were 12 other inductees honored at the ceremony, the greatest interest by the public and the press was clearly focused on the choice of Milk. Protesters criticized the selection of the famed gay-rights pioneer for the Hall of Fame. 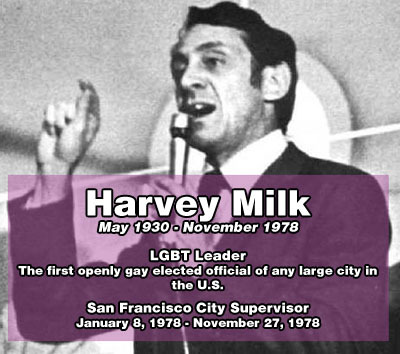 A group from San Leandro’s American Warrior Evangelical Ministry marched outside the ceremony venue carrying signs reading, “Harvey Milk was a pervert.” The Bay Area Reporter quotes one of the demonstrators, Ken Arras, as saying, “We just believe that [Milk] is undeserving of this honor. He may have been a nice guy outside of his immoral lifestyle, but what has he done? This award is all about his lifestyle. It’s just about him being a homosexual.” Another of the San Leandro protestors, Don Grundmann, admitted that Milk’s murder was “a fantastic tragedy,” but argued that an assassination is insufficient reason for public recognition, referring to both the Hall of Fame induction and to Harvey Milk Day, which he claimed was a direct assault on children. Grundmann went to to assert that no LGBT person should ever be inducted in the state’s Hall of Fame since “it would lead to acceptance” of immorality by impressionable youth. Earlier in the year, Governor Schwarzenegger signed a bill sponsored by San Francisco’s openly-gay State Senator, Mark Leno, creating May 22 “Harvey Milk Day,” a day of special significance throughout California. The Hall of Fame’s Class of 2009 included other stellar Californians, such as football coaching legend, John Madden, actor Carol Burnett, Chuck Yeager, the first test pilot to break the sound barrier, filmmaker George Lucas, and author Danielle Steele.